MANILA, Philippines- Brian Poe Llamanzares, the son of presidential candidate Senator Grace Poe, earned the ire of netizens after posting a photo of him wearing an alleged expensive pair of shoes on his Instagram account. The shoes in question is a limited edition 2011 Nike Mag10 Back to the Future II Marty McFly 2015. 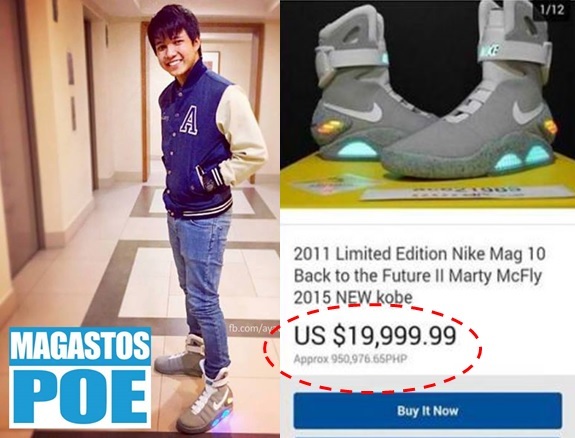 The pair of kicks apparently costs a whopping $19,999 or over P950,976 based on a posting on Ebay. The Facebook page Ayaw Ko Poe shared the controversial photo of Llamanzares on Friday, February 12. Several netizens can’t help but speculate as to how Llamanzares was able to afford the luxury shoes. However, many were quick to defend Llamanzares saying that there’s nothing wrong if he was able to purchase it using his hard-earned money. Meanwhile, Poe revealed that she already discussed the issue with her son when it first came out last month. According to Poe, Llamanzares showed her how much the shoes cost. Poe also stressed that Llamanzares used to work but was asked to take a leave in order for his company to maintain objectivity as his mother is running for president in the upcoming May 2016 elections. Llamanzares used to worked as a neophyte reporter for a television network. Poe also urged the public to spare her family from being dragged in political issues. Update: Brian has released statement on the alleged lavish shoes, he said he bought the pair online for just P10,000 from his own savings far from the speculated almost a million pesos price. He wanted also to end the issue. “The shoes did not cost as much as the rumors claim it to be. I bought it online at P10,000 from my own savings. It did not come from government funds as I am a private citizen and not working as a public official,” Brian shared to news website Rappler.